Wrap a dreamy silk scene around your neck with Karen Mabon's original design. Karen Mabon attended London's Royal College of Art, where she studied design and illustration. 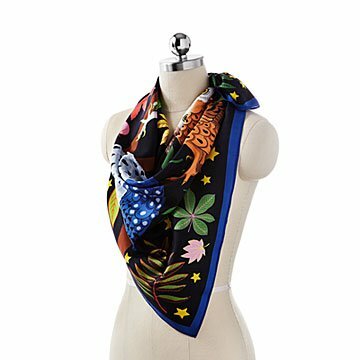 After graduating, she became known for her highly imaginative scarves. All of the pieces in Karen's collection tell a story or evoke a dream-like feeling in the wearer. She describes them as having "characters from an old, forgotten film." Whether they're used every day or as "wow" pieces, Karen's designs are truly wearable works of art.